SHENZHEN, China, April 3, 2019 /PRNewswire/ -- CZUR, a leading smart hardware solution provider, has announced plans to exhibit its latest series of innovative products at three major electronics exhibitions in Asia and Europe this April. The provider will showcase its three flagship scanners -- the Aura Portable Personal Scanner, ET Series Book Scanner and M Series Professional Book Scanner -- at the 2019 Hong Kong Electronics Fair and AsiaWorldExpo's Global Sources Mobile Electronics Show in Hong Kong, and SVIAZ 2019 in Moscow, Russia. "By featuring our products at these international exhibitions, we hope to have a global platform to share our vision to revitalize the personal and professional workspace using smart technology. As our base is in China, Asia remains our primary market; however, we are expanding into North America and Europe by leveraging Amazon partnerships and key exhibitions, such as the DISTREE Europe, Middle East & Africa buyer channel event in February and the upcoming SVIAZ 2019," said Kang Zhou, CEO and Founder of CZUR. No stranger to the technology industry, CZUR is Zhou's fifth entrepreneurial endeavor, and was born in 2013 when Zhou and his friends identified a gap in the market for efficient and accurate book scanners. Its inaugural M1000 scanner was launched in 2013. 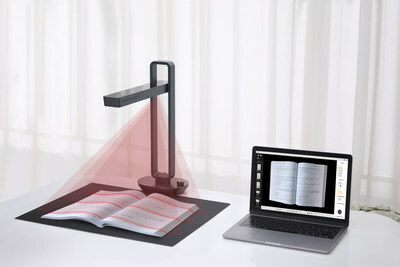 The company offers a range of products that utilize technology to improve productivity and efficiency in home and professional environments, including the latest Aura smart scanner which received the IF Product Design Award (2019), Red Dot Design Award (2018) and the Golden Pin Design Award (2018). CZUR received an USD 10 million angel+ financing in 2014 and completed Series A funding round in 2016. In the future, CZUR will continue developing its overseas presence with plans to open a marketing department in the US. CZUR will also commence crowdfunding in April on Kickstarter for its brand new CZUR Notebook.